Triangle Collision is a member of the Assured Performance Network. We have the tools and the factory trained technicians to restore your Dodge to pre-accident condition. When looking for Dodge repair, it’s important to find a shop that follows factory guidelines during the repair process. This is why we confidently stand behind our repair work with a Lifetime Warranty. A Certified Dodge Body Shop can give you a guarantee that a non-certified shop can’t offer. We have proven ourselves through Dodge specific factory training and have equipped our technicians with the factory approved tools and equipment that is needed to restore Dodge vehicle’s to like-new condition. All vehicle’s are built with unique structural designs, materials and technologies that need a factory approved repair process to fix. We do this because only a factory approved repair can successfully restore the performance, safety and value of your Dodge. It’s your choice, not the insurance companies, where your vehicle is repaired. Choose Triangle Collision, the Cary, NC area’s premiere Dodge Body Shop & Collision Center. The last thing you want to think about during the repair process is the possibility of a second collision. However, in order to protect the safety of our customer’s we make sure all of your Dodge’s safety systems are repaired and calibrated to meet exact factory specifications. Even seemingly minor damages can cause issues with safety systems such as air bags, where precision is vital for the safety of the driver and passengers. 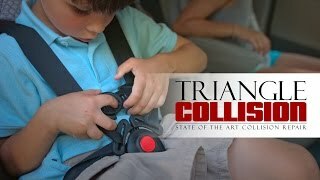 At Triangle Collision, the safety of our customers is our top priority. It is our job to make sure that the right parts are used during the repair. Only when the safety features meet factory approval is our repair complete. BASF technologies are manufacturer approved to restore the aesthetic value of your Dodge. We can guarantee that we will be able to perfectly color match the original color of your car. It’s not just about looking good. Refinishing needs to be done properly to avoid damages such as corrosion. Let us take the stress of dealing with the insurance company off of your hands. We understand the claims process and will work with the insurance company to get your Dodge back to pre-accident condition.